Students in the South Pacific are finding lessons delivered via satellite much easier than attending classes in the old-fashioned way. The catchment area for the University of the South Pacific is enormous, stretching across 33 million square kilometres of ocean and five time zones. In addition, the 12 island nations that own the university straddle the International Date Line. When a Monday morning lecture takes place on the main campus in Fiji, it is still Sunday in Samoa or the Cook Islands. The university is considered a pioneer in the field of distance-learning. 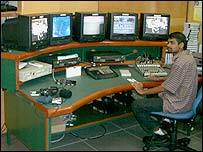 Its own satellite link, USPNet, allows students on remote islands to follow lectures on its main campus in real-time. 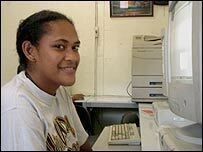 A student sitting in a classroom in the Marshall Islands, a group of atolls and reefs, can easily listen to a geography lecture taking place 3,000 km away at USPNet headquarters in Suva. A TV monitor allows the lecturer to display diagrams or charts. The alternative would have been a lengthy and prohibitively expensive journey. "From Suva you first of all have to go to Kiribati which is about four and a half hours by the HS487 - a very slow plane," explained university librarian, Dr Esther Williams. "And from there you go to Marshall Islands which is another four hours. So it takes all day." The university is building a new $15m information communications technologies centre to showcase this technology. It will turn out the computer graduates of the future and act as an incubator for new businesses. It also plans to link to AARNet - the Australian research and education network - delivering bandwidth and allowing the university to deliver flexible courses across the Pacific, even at village level. "Normally people would have to travel to a main urban area or in the case of degree study, they would have to travel to the main campus", says Acting Vice Chancellor Professor Chandra. "They would either have to go to another island or another country to study. "With this new system, you will have access to education in your own village, in your own home and with the flexibility that you study when you want to study." The university aims to deliver all courses in this way by 2020. But its ability to fulfil that dream depends partly on the expansion of telephone and internet services throughout the Pacific. Some 700 out of the 900 villages in the Fiji Islands - one of the region's more developed states - still lack a basic telephone service. David Prosser's report on the University of the South Pacific was featured on the BBC Go Digital programme. He travelled to Fiji to look at the role of technology in development for the BBC World Service Trust. The Trust is the international development arm of the BBC, tackling poverty with communication development projects.